Simple sugars might not be very good for you, but they taste delicious. Also known as simple carbohydrates, simple sugars can be found in a wide variety of foods, ranging from fruits and vegetables to dairy products. Candy and soda are big sources of simple sugars as well. Carbohydrates have been vilified and praised, making them one of the most controversial of the three macronutrients. However, not all carbs are created equal. Sugars are a class of chemical compounds. Monosaccharides and disaccharides are examples of simple sugars. More complex carbohydrates are oligosaccharides and polysaccharides. They contain more than two sugar molecules and can be very complex. Most of the carbohydrate foods that you eat, like pasta, rice, potatoes and grains are made of these more complex sugars. Even though they're often thought of as simple carbs, they're not as simple as monosaccharides and disaccharides. 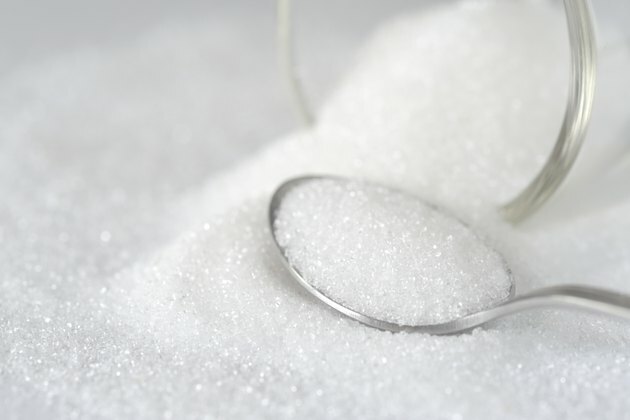 Read more: What Are Simple Sugars? Sugar that can't be broken down into any simpler form of sugar is known as a monosaccharide, according to an article from Purdue University. This is as simple as simple sugars get. Glucose and fructose are examples of monosaccharides. Honey is one of the most glucose-rich foods around, according to an article from MyFoodData. Honey is so sweet and sugary that some people use it to sweeten drinks like tea and cocktails. Glucose is the main source of carbohydrate found in the blood of higher animals, according to an article from Britannica's website. As more complex carbohydrates are eaten, the digestive system breaks them down into glucose, since glucose is the simplest sugar. Glucose levels are what people with diabetes have to worry about. Both Type 1 and Type 2 diabetics have difficulty regulating their blood glucose levels. Normally the body produces insulin to regulate blood glucose by pulling it out of the bloodstream and into fat cells. However, diabetics either can't produce insulin or it doesn't function well, so they have to be careful of how much carbohydrate they eat. Fructose is a monosaccharide as well. As you might be able to guess from the name, fructose is the primary sugar found in fruit. The conundrum of fructose is that, although fruit is considered healthy, fructose, as a simple sugar, is generally considered unhealthy. An article from the International Food Information Council Foundation says that fructose is neither good nor bad. That means the sugar itself doesn't have nutritional value other than providing energy. Eating fruit is healthy because there are vitamins, minerals and fiber in fruit that add nutritional value to the sugar. Drinking fruit juice, however, isn't as healthy because there's much more sugar. High-fructose corn syrup is a popular sweetener associated with fructose. It's made by processing corn starch until it breaks down into the simple sugar glucose. An article from the U.S. Food and Drug Administration states that an enzyme is added to the broken-down corn syrup to convert the glucose it naturally contains into fructose. Galactose is a third monosaccharide, but it isn't nearly as common as glucose or fructose. Galactose can be found in dairy, usually combined with another type of sugar, according to an article from Britannica. Disaccharides are the other form of simple sugar. They're simply made up of two sugar molecules, which means that they can be broken down further, unlike monosaccharides. Lactose is the disaccharide most commonly known, since so many people aren't able to digest it. Lactose is the prevalent sugar in dairy products. It's made of two monosaccharides: glucose and galactose, according to a paper from Intermountain Healthcare. Milk and other dairy products get their slightly sweet taste from lactose. If you check the nutrition facts on the cartons and packages of your favorite milk, yogurt, ice cream or cheese, chances are you'll see a fair amount of carbohydrates. There's more sugar in dairy products than you might think. Lactose intolerance is a common problem. If you're lactose intolerant, it means that you can't digest the simple sugar lactose, according to an article from the National Institute of Diabetes and Digestive and Kidney Diseases. Ingesting dairy products can wreak havoc on the digestive system of anyone with this intolerance. Table sugar is a disaccharide. The correct name is sucrose, and it's a combination of the simple sugars fructose and glucose. Unlike fruit, which has nutrients, table sugar doesn't have added nutritional value. It's a pure form of sugar, which makes it unhealthy. Try to limit your consumption of table sugar and use it only to add flavor to foods or drinks. Sucrose is present in foods other than table sugar. Maple syrup, for example, has sucrose. Some fruits actually contain sucrose, instead of fructose. According to an article from University of Wisconsin Health, fruits like apricots, apples, bananas, grapefruit and others contain sucrose. Added sugar in foods is often in the form of sucrose. This means that some sodas, dairy products or frozen foods might contain sucrose. Maltose is two glucose molecules joined together. It's found mostly in grains and vegetables. As an additive for some foods, maltose typically comes in powder form and can thicken and sweeten things like milkshakes. Starch, which is the carbohydrates found in foods like potatoes, rice and wheat, is actually a polysaccharide. That means it's not a simple sugar. Starch is a compound that plants make to store energy. The foods that contain starches are often thought of as bad carbs, but they're actually more complex than the sugars in fruit. Simple sugar foods are considered unhealthy because your body breaks them down very quickly. That means the sugar hits your bloodstream and causes your blood sugar levels to rise rapidly. More complex carbohydrates take longer to digest and don't spike your blood sugar as much. When your blood sugar levels spike, your body has to release insulin to pull glucose out of your bloodstream. You might feel drowsy when this happens. This is known as a crash, and it comes from eating sugary food. Try to limit your intake of simple sugars.